Yes, I know. But hey, none of us are perfect all the time. 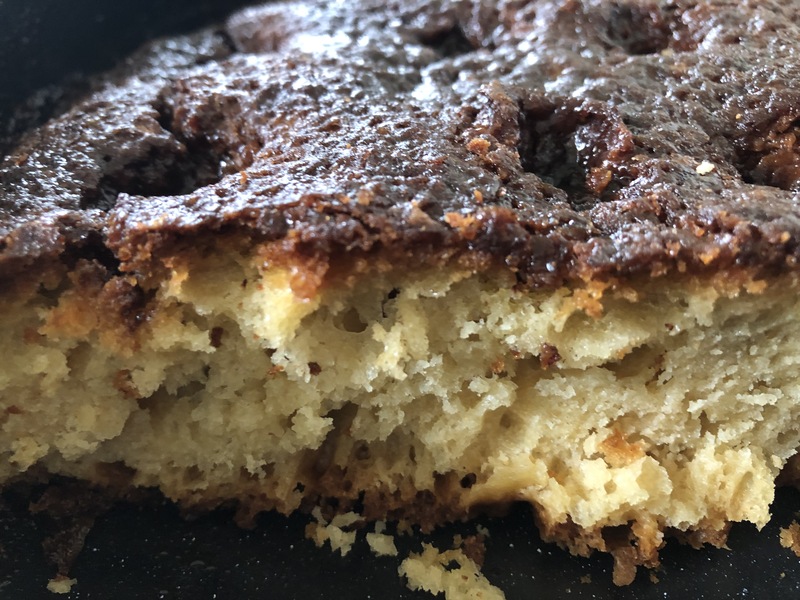 I don’t have sugar in tea or cereal or anything like that, but I like the darker sugars and this simple cake ticked a lot of boxes. At the moment I’m exploring The Nordic Baking Book by Magnus Nilsson, and I’m finding some of the ingredients and equipment a bit of a challenge (reindeer stock, anyone?) My first recipe attempt from the book – Swedish rye crackers – was a disaster and landed in the bin, and I’ve learned that some things can’t be substituted. Baker’s ammonia, for one. But the range of flavours and the baking style that are emerging from Scandinavia really appeal. My northern German heritage finds a lot to like there. soft inside, caramel on the outside. Today delicious. Today’s cake is basically a sweet bread topped with caramel. Fresh and hot out of the oven it was irresistible. This recipe wanted fresh yeast, and I’m sure it’s better that way, but I didn’t have any and substituted dried. Please note: if your yeast is from a previously opened packet, you will probably need more than the stated amount, as it loses its potency. My cake ended up very slightly crustier than I was expecting, which I think was a combination of using bread flour and perhaps a slightly too high heat in the own (I started at 205C for the first 20 minutes, as my oven often seems to run a bit cooler than recipes want, but in this case that was a mistake. Next time I’ll stick with 200C). 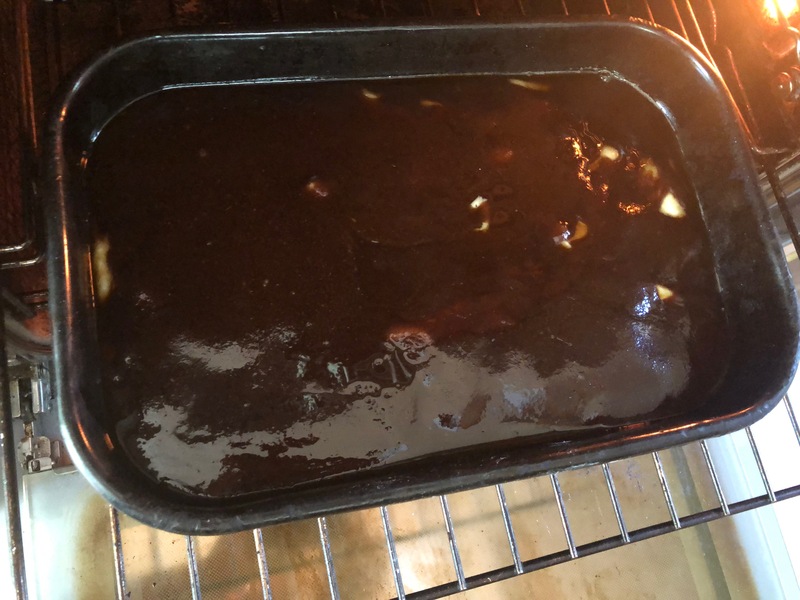 The cake is dark, but that’s just the caramelised dark sugar – there was not even a trace of a burnt favour. It was a big hit with everyone. 7g dried yeast (25g fresh) dissolved into the milk. 500g flour (The recipe specifies not to use baker’s or bread flour, but I did since it was what I had, and it still worked, though it was probably crustier than it could have been). Mix everything. I tend to use the No Knead method for all yeasty stuff, so I stirred until it was just mixed and then kneaded only long enough to get it into shape. The recipe calls for it to be kneaded in a stand mixer with a dough hook for 8-12 minutes. Spread it on a baking tray and leave to rise until doubled. The topping liberally covers the cake as it goes into the oven. Place it all in a saucepan and melt. Stir until it’s warm and all the sugar and butter is dissolved. When the dough has risen, poke dimples all over the surface (mine were more regular and there were fewer than the recipe picture suggested, and I think more and messier would be better). Then pour the liquid topping over. It will form a thick layer. Place in a 200C oven for about an hour.